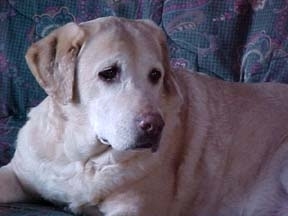 Labs do not require extensive grooming. A quick brushing once a week will remove dirt and dead hair. Generally, labs do not need to be bathed unless they get into something disgusting! Use a shampoo designed for dogs rather than for people. Inspect your dog's ears regularly. You may need to clean the ears to remove excess waxes. Ask your veterinarian for cleaning instructions. Cleaning and drying your dogs ears after swimming may help to prevent infections. If the ear channel is red, swollen and foul-smelling, treatment is required. Your veterinarian may prescribe medication and an ear cleaning fluid. Use a flea comb to check for fleas on your dog. Many dog owners have problems with fleas from time to time. Understanding the flea life cycle will help you control them. Fleas spend more time off the dog then on them. About 3/4 of the fleas will be in the carpets and in the area where the dog sleeps. If you have a flea problem, treat your dog to remove the adult fleas, then wash the dog bed and clean your carpets. In warm weather, check your dog regularly for ticks. Ask your vet for removal instructions if you don't know what to do. Many of the products on the market today control fleas. Some products control both fleas and ticks. Ask your veterinarian about the newer, safe pest control products. Some are used to treat exiting flea problems and other products are used to prevent the larvae forms from maturing into fleas. Bravedo prevents both flea and tick problems for up to 3 months. Toenails need to be cut regularly, about twice a month. Your veterinarian will show you how to clip nails. If you start when your dog is a little puppy, your dog will get used to nail clipping. I recommend cutting nails once a week while the puppy is little. If the nails do not need to be cut, go through the motions just to get the puppy use to being handled. Don't forget the dew claws.